Our Texas certified appraisers are the leading providers of independent residential and commercial real estate appraisals in the Rosenberg market area. We strive to deliver an appraisal service that meets our clients needs and is delivered with an industry leading turn time. We have some of the lowest appraisal fees in the area and we take pride in delivering reports faster than the average appraisers. Furthermore, our appraisers are able to provide valuation services for any use including lending, private matters, insurance, legal issues and any other situation that requires an accurate and reliable property value. Be it homeowners or industry professionals, our dedication to you remains the same – to provide a reliable and courteous appraisal service. If you’d like to discuss your appraisal needs in more details please contact us via the phone number on this site or the online contact form found above. 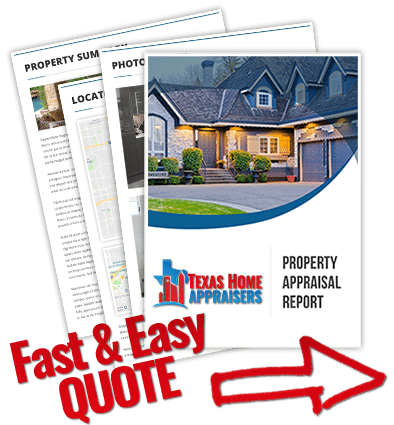 Do you need a certified houston real estate appraisers today? Call the #1 appraisal company or use the online quote form and a member of our staff help you shortly. The FNMA URAR 1004, commonly associated with “Fannie Mae” loans, has additional reporting requirements that have more significance for the lending process than with the actual dollar market value. The most fundamental way to determine market value is to compare the subject property to recently sold homes in a given neighborhood. We find that the 1004 forms are very redundant of full of information that is typically useless to the average person. An example of this extra data would be census and SMSA information which is strictly for lender’s internal tracking of loans. The general purpose forms we provide to private clients will satisfy any appraisal use and are very easy to read and understand. Though most of appraisers steps in providing a value are done from their office, the appraiser’s first step in the appraisal process is defining the problem, or scope of work pertaining to the property being appraised. Real property includes the physical land and appurtenances affixed to the land such as a underground pools, a built-in gazebo, boat docks, and outdoor kitchens. This information will help to assist the appraiser throughout the valuation and comparison process. To determine the gross living area of a home, an appraiser will typically take measurements from the outside first. This allows him to survey the exterior grounds and determine what is part of the gross living area. Once he has calculated the outside measurements, he will then come into the property to measure garage space and any second floor GLA. It’s imperative that an appraiser accurately measures and takes out any non-living areas to ensure that the GLA is correct. Are there certain documents I should have on hand before an appraisal takes place? Though an appraiser is required to research and gather all his or her own data, it’s always best to gather anything and everything you feel may support the appraisal. With that in mind, if the appraisal is for a sale the appraiser will almost always want to see the sales contract. Certain conditions such as sellers concessions and allowances may need to be considered by the appraiser. You appraiser could also be assisted by any of the following documentation: A property survey that includes the home. Deeds or title docs which contain a legal description. If selling, a list of personal property that will be included in the sale. A list of upgrades and improvements made in the last 5 years. A copy of the original plans & specifications is another items that is almost always helpful to an appraiser.